A patent is a legal monopoly, granted for a limited time by a country to the owner of an invention in exchange for public disclosure of the invention. A patent gives an inventor the exclusive right for a limited period of time to stop others from making, using, offering for sale, selling or importing the patented invention without the permission of the inventor. Merely holding a patent does not give the owner the right to use or exploit the patented invention. That right may still be affected by other laws such as health and safety regulations, food and drugs regulations or even by other existing patents. That is why a patent is called a "negative right". Patents are generally concerned with functional and technical aspects of products and processes and must fulfill specific conditions to be granted. Most patents are for incremental improvements in known technology - evolution rather than revolution – meaning that the technology does not always have to be complex. A patent, in the eyes of the law, is a property right that can be given away, inherited, sold, licensed and even abandoned. As it is conferred by the State, the government can in certain cases revoke the patent (even after the grant of patent or even if it has been sold or licensed to another in the meantime). Patent rights are territorial, so an Indian patent does not confer any rights outside India. Patent rights last for 20 years in India and this is also generally the case globally. Depending on where you wish your patent to be in effect, you must apply to the appropriate national Patent Office. Interestingly, in India, there are 4 Patent Offices in total, with Kolkata being the Head Office and branch Offices located at New Delhi, Chennai & Mumbai. Applying to any one of the Patent Office branches is sufficient to begin the process of obtaining an Indian patent. The Patents Act 1970, as amended by The Patents (Amendment) Act 2005. The Patents Rules, 2003, as amended by The (Amendment) Rules 2006.
Who can file a patent in India? An application for a patent for an invention may be made by any person claiming to be the true and first inventor of the invention or by his/her assignee or by the legal representative of any deceased person who immediately before his death was entitled to make such an application. There are no age requirements and a minor is also entitled to apply for a patent. An application may be made solely or jointly with any other person. Foreigners and nationals not living in India need an address for service in India for filing an application in India. They may appoint a registered agent or representative whose address for service can be the address for service in India. The inventor is the person who thinks of the idea and not the person who executes the idea. It may be the case that the inventor is also the applicant but this is not always so. A corporate body cannot be named as an inventor. It is important to consider and distinguish between the name of the inventor and that of the applicant at the time of filing a patent application. An application for a patent must be filed at the Patent Office branch within whose territorial jurisdiction the applicant resides or has his principal place of business or domicile. A foreign applicant must file at that Patent Office branch within whose jurisdiction his/her address for service is located. India allows the filing of both provisional and complete patent specifications. When the idea is at early developmental stage, a provisional specification (PS) can be filed, otherwise a complete specification (CS) may be filed directly. Where a PS is filed in the first instance, a complete specification (CS) must be filed within twelve months. Filing a PS gives the inventor time to further develop his/her ideas by carrying out further experiments or tests in order to provide a more detailed description of the invention in the CS at a later stage. Where two or more cognate provisional specifications have been filed, they may be combined and all their subject matter may be incorporated into a single CS to be filed within twelve months of the date of the earliest filed PS. Consideration may also be made for PCT filing and Convention filing at this time. Priority date is the date on which the first application in respect of an invention has been filed. It is mandatory at the time of filing a patent application in India, to inform the Controller of the details of all applications corresponding to the same invention in other countries and to undertake to keep the Controller so informed up to the grant of the Indian application. Failure to do so could result in the refusal of the application in case it is opposed or even revocation of a patent in proceedings before the High Court. For more information, please refer to our article on Section 8 requirements. Publication of an application takes place approximately 18 months from the date of the application in the Official Patent Office Journal, which is published every Friday and available online. Urgent publication is possible on request on payment of requisite fees. From the date of publication of the application for a patent and until the date of grant of the patent, the applicant will have the like privileges and rights as if a patent for the invention had been granted on the date of publication of the application. However, the applicant is not entitled to institute any proceedings for infringement until the patent has been granted. The Indian Patent Office makes both formal and substantive examinations. A Request for Examination has to be made within 48 months of the priority date by paying the requisite fees. If no request is made within the stipulated time period, the application will not be examined and the patent will be considered as withdrawn by the applicant. In India, it is not possible to file a request for examination after the deadline by paying a penalty or surcharge. An applicant is required to meet all the objections and requirements of the Patent Office within a period of twelve months from the date of the first examination report (FER) issued by the Controller. No extension of time is permitted. If a patent application is not put in order in twelve months from the date of the FER, it lapses. An applicant may, of his own accord, apply to the Controller for amendment of his application or any document filed in respect thereof but such amendments may be filed only by way of correction, explanation, or disclaimer. Amendments may be filed before or after grant of the patent. Furthermore, a divisional application can be filed u/s 16 at any time before the grant of a patent in respect of an invention disclosed in a PS or CS already filed. It is usually filed when the claims of a CS relate to more than one invention but the subject matter of the divisional application cannot be beyond the matter disclosed in the parent application. The applicant may file a divisional application voluntarily and the advantage of this is that the priority date of the divisional application starts from the date of the parent application. Otherwise, the Examiner may also require filing a divisional application if there is no unity of invention i.e., the invention described actually relates to more than one inventive concepts. Where an application is made for a patent in respect of any improvement in or modification of an invention already described or disclosed in a filed CS (i.e. the “main invention”), the Controller may at the request of the applicant, grant the patent for the improvement/modification u/s 54 as a patent of addition. The grant of an application is published in the Official Journal and is notified therein for post-Grant opposition. A patent can be revoked within one year after grant by post-Grant opposition proceedings before the Controller of Patents. It is possible for a patent to be revoked on the grounds of: prior publication anywhere in the world, public use or knowledge in India, lack of novelty with regard to the subject matter, obviousness, lack of inventiveness, ambiguity, insufficiency of description of the invention, fraud, false suggestion or representation that the person named as the inventor is not the true inventor, lack of utility, non-patentability of subject matter (E.g. food, drug or medicine per se, atomic energy, mere admixture, mere arrangement of known devices, process of testing, method of agriculture or horticulture, process of medicinal treatment), failure to furnish or falsity in information regarding corresponding applications in other countries supplied to the Controller or that the invention is contrary to law or morality. Except in the case of a patent of addition, for which no annuities are payable, annual renewal fees must be paid during the life of an Indian patent, the first of such fees falling due at the end of the second year of the life of a patent granted. Renewal fees due during the pendency of the application are payable within a period of three months from the date the patent is taken on record in the Register of Patents. Renewal fees for two or more years may be paid in advance if the patentee so desires. A maximum extension of six months may be obtained on payment of the prescribed penalty fees. If the renewal fee in question is not paid within the extended period available, the patent will lapse. A lapsed patent may be restored if an application for restoration is made within 18 months of the date of lapsing of the patent, provided it can be shown that the lapsing of the patent was unintentional and that there was no undue delay in making the application for restoration. Every patentee and every licensee is required to furnish within three months from the end of every calendar year, a statement as to the extent to which the invention has been worked in India on a commercial scale in the preceding year. Non-filing of this statement is a criminal offence. 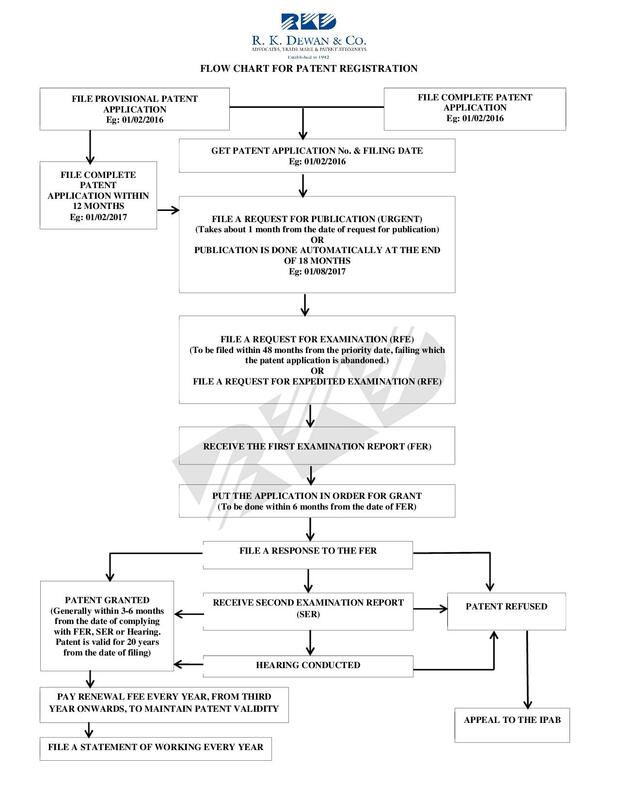 After three years from the date of grant of a patent, an interested party may apply to the Controller for the grant of a compulsory license alleging that the reasonable requirements of the public with respect to the invention have not been satisfied or that the invention is not available at a reasonable price. If the Controller is satisfied that a prima facie case for an applicant for compulsory license has been made, he shall serve a notice on the patentees who, if they so desire, may oppose the application for compulsory license. Marking is not compulsory but advisable as otherwise damages may be difficult to recover in cases of infringement. The invention may be marked with the word “Patented” or “Patent” accompanied by the number and year of the patent. An infringement suit may be instituted by a patentee or his exclusive licensee. Every ground for revocation is available as a defense and revocation can be counter claimed in infringement proceedings. The Court may grant relief in respect of a valid claim or claims even though one or more other claims in the suit may be held to be invalid. Relief may include damages and costs as awarded by the court. A suit for injunction may be instituted and damages recovered in cases where there have been groundless threats. Any person may institute a suit for declaration as to non-infringement of a patent. The onus of proof of non-infringement lies with the defendant. Anyone can file an opposition by way of representation at anytime after the publication of a patent application but before the grant of the patent on the grounds available u/s 25(1). Only a person interested can file a notice of opposition before the Controller of Patents at any time after the grant of patent but before the expiry of one year from the date of publication of grant of a patent on the grounds available u/s 25(2). On a counter-claim in a suit for infringement of the patent at the High Court. Convention application: Priority can be claimed in India from the earliest corresponding application in a Convention country, provided that the Indian application is filed within twelve months of the priority date. Multiple and partial priorities are allowed. The national phase application in India has to be filed within 31 months of the priority date of a PCT application. Applicants must file along with their application, a declaration of inventorship in Form 5. The controller may, on a request made in Form 4, extend the period of filing this declaration by one month. It is mandatory to submit Form 27 every year for both Indian and foreign applicants providing information about the commercial working of the patent in India. Refusal or failure to supply such information is punishable with a fine. Also, if an applicant knowingly furnishes false information, he/she would be liable for imprisonment and/or fine. the mere use of a known machine or apparatus. The explanation to section 3(d) further clarifies that the salts, esters, ethers, polymorphs, metabolites, pure form, particle size, isomers, mixtures of isomers, complexes, combinations and other derivatives of known substance may be considered to be the same substance. It however states that such salts, esters, ethers, polymorphs, metabolites, pure form, particle size, isomers, mixtures of isomers, complexes, combinations and other derivatives of such known substance may be considered as patentable only if they differ significantly in properties with regard to efficacy. In a recent case, in relation to a pharmaceutical substance, the courts held that efficacy means ‘therapeutic efficacy’. For proving increased therapeutic efficacy, strict standard of proof is required. In other words, in order to overcome the hurdle posed by Section 3(d), data based on research and experimental data showing enhanced therapeutic efficacy must be submitted. This provision strikes a balance between public interest (access to existing drugs at reasonable prices) and private interest (monopoly rights under patents). A compulsory license merely serves to limit the exclusive monopoly rights of a patent holder. In order to prevent abuse of patent rights, the government may authorize the grant of a compulsory license without the permission of the patent holder. that the patented invention has not been worked in the territory of India. If the Controller is satisfied that a prima facie case for an applicant for compulsory license has been made, he shall serve a notice on the patentees who, if they so desire, may oppose the application for compulsory license. It is possible to patent programs for computers which when run on a computer produce a "technical effect or includes hardware". However, if a program does not produce a technical effect when run on a computer, it is unlikely to be patentable. A technical effect is generally an improvement in technology and needs to be in an area of technology that is patentable. For instance, an improved program for translating between Japanese and English is not patentable because linguistics is a mental process, not a technical field. On the other hand, a program which speeds up image enhancement may be patentable because it produces a technical improvement in a technical area. Some countries, such as the USA, with a large potential market for your software, have a more liberal approach to software patenting and often grant patents for software, which would be excluded in India and other countries. Deciding whether or not a particular computer program is patentable is a complex issue and advice from a Patent Attorney/Agent may help to determine the most effective form of protection available.